I finished another little crewel embroidery yesterday, so here it is. I didn't plan to do the sheep with turkey knots from the start. I had been thinking long and short, but then when I stopped to think about my other choices, I decided to give the turkey knots a go. I used 3 strands in the needle. It made it easier to try blending the colors. I didn't really know how close together the stitches should be for a nice result, but three strands is really a lot of yarn. I didn't really expect the result to be quite this dense though! It's very soft and fluffy, just as a sheep on fabric should be. It is quite high above the fabric too. The only thing is, the head is looking a bit flat compared to the body. But since the head was already stitched, I let it be as it is. I got some questions on Flickr about crewel work last week. I had been thinking to write out nice answers here as Flickr really isn't a good format for anything other than very short messages. If any of you have any questions, you can leave them here. I will be answering them shortly! As always, thanks for the comments, and thanks for reading my posts!! 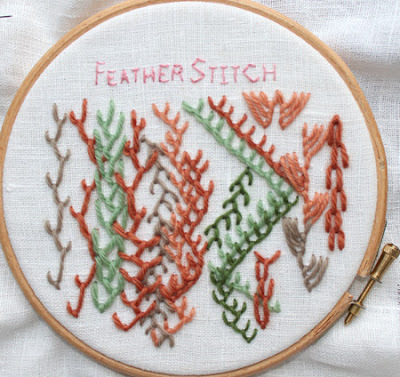 I hope you get a little inspiration from my work to pick up your needles! I've been busy working on more wool stitching! My subject this time in an octopus. I wanted a semi-realistic shape so I did a photo search and got a feeling for how the head should be. The tentacles are a bit exaggerated, but I wanted them long so you get the feeling of them floating around in the water. After I made the octopus, I added the seaweed on the sides and the middle. I managed to use this week's TAST stitch, the feather stitch in there! And even better I found a great use for the wheat ear stitch. Makes perfect sea plants. Lots of french knots and a starfish finished off the embroidery. I really filled the fabric this time! 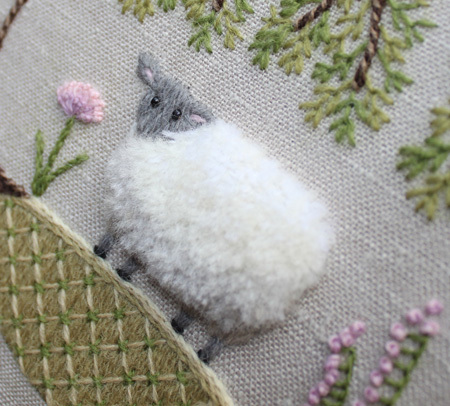 Next up is a sheep. I already made the design. And finally, we went out to the flea markets yesterday as we often do. I found something a bit special this time. 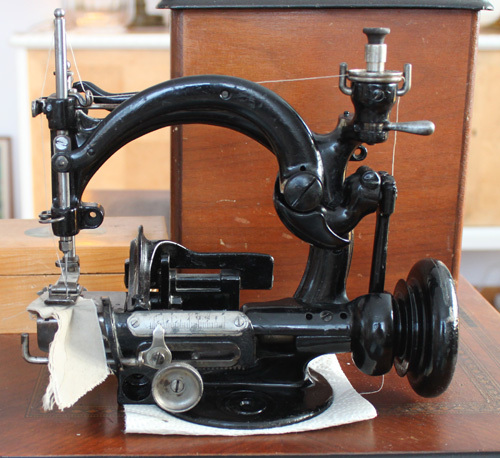 Unfortunately the name and name plate are missing, but this is a Willcox and Gibbs sewing machine from about 1885. 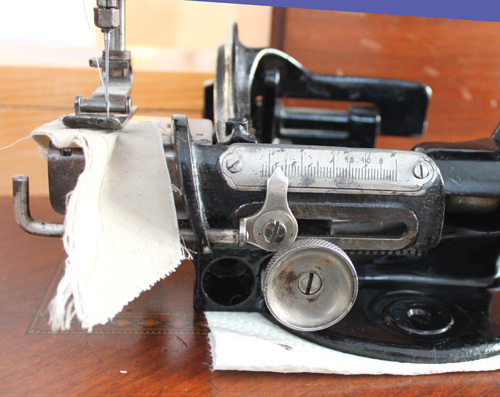 It has no bobbin and makes a single thread chain stitch. This design was patented in the 1850's. I can tell you, this little machine isn't a lightweight. They surely don't make them like this anymore! In the background is an antique Husqvarna sewing machine from the early 1900s. So now the count is up to 3 antique machines. I swear I am not a collector, it's all Mr Floss Box's fault! I made a little sampler. This time I used tapestry wool yarns. They are soo nice for making these sorts of samplers. Nice, fat yarns, so you can really see the stitches. And I discovered that I really like these yarns because they sit up on the fabric and give lots of extra dimension. This sampler is different! Basically, I threw out the idea of making nice even rows of perfect stitches. Why not let some of the chaos that surrounds our lives come out in the needle. I know there is an instant left-brain reaction not to like it, but you can't help looking extra, trying to find the patterns. I just stitched, I stitched right over other stitches if they were in the way. I really like the layering in any case. It's complicated and sometimes hard to see what's underneath. Ok, maybe I am reading a lot in, but I just couldn't be "neat" with this one. I re-stitched a design, something I almost never do. 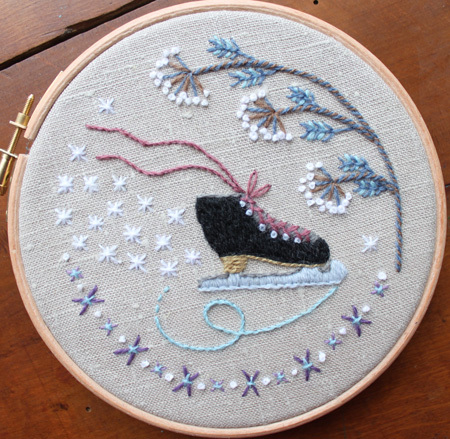 I needed to know the amount of thread I used, so I chose to do the skate in black for something different. The black is a little more dramatic maybe, but not so different. I was uncertain of my color choice for the branches on the side, but working with the colors again, I think they work together quite well. I mirrored this one so I could place the two skates side-by-side. I've completed my embroidery journal project for the month! It's a bit different, but it has a meaning. I thought about what theme I wanted for the month and decided I would use new beginnings. It took me awhile to choose this theme. I've considered many others. New beginnings - not just because it's a new year, but also because I feel I am starting a new phase with my embroidery. I am hoping to break out of some of the boxes I put myself in and try new things and new ways of incorporating stitches. In short to see more of the possibilities embroidery offers as an art-form and hopefully to increase my creativity. After I decided on a theme, I sat down with a pencil and just starting drawing. I didn't know what it would become. 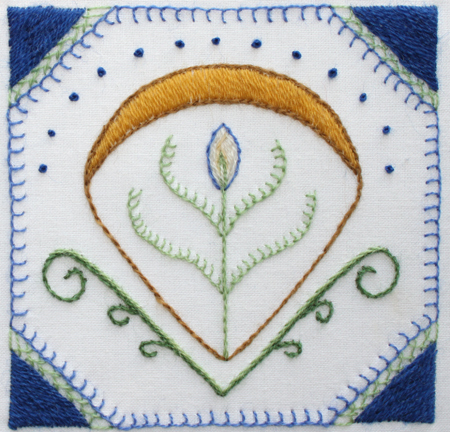 I decided that what I had drawn represented a seed - the small plant and the shell around it. I thought a seed was a great symbol for new beginnings. I used a lot of blanket stitch in this project. It isn't a stitch I have used all that much so far, but I put it in my drawing and decided to stitch it that way. I stitched this project with a fine wool thread - also new for me to work with. It went through the woven cotton fine and even with the backing fabric it was fine too. But it didn't feel right until I switched to a bigger needle, then it was much smoother. I admit I had doubts as I worked on this project - it felt a lot different than my other projects, but in the end I am satisfied with it as a starting point for my embroidery journal project. The first project of the year is now completed! 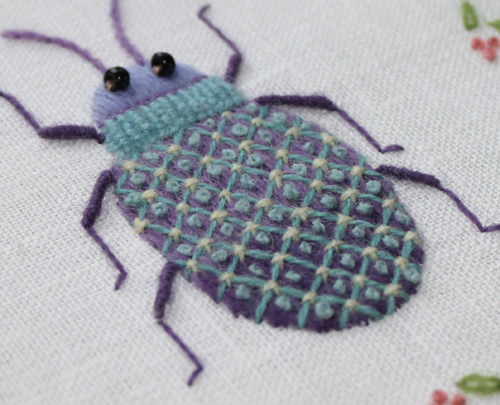 This one I am calling "Crewel Beetle". That gives the whole thing away, so here it is! 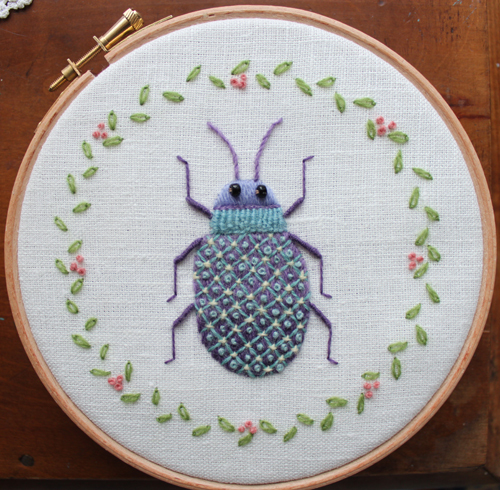 I used some classic crewel embroidery stitches here, namely the beetle's body. I took the time to lay the lines carefully to be as parallel as possible. Nearly all of them I had to pull out and re-lay at least one time, but I think this is the best job I have done so far with this stitch. The first leg section on all 6 legs are bullion knots. I thought those worked out pretty well. I was a little bummed because the paper slipped a bit while transferring the design, so the body is not perfect. I didn't realize it until I had the body already filled in. Sometimes that is the way it is, so I pressed on. These crewel projects are fun. I'll be making more of them, but I am mixing in some other projects too. I'm calling this series of patterns "Crewel in a Hoop". It wasn't a planned out idea, but the 6-inch hoop is a great size for working in. Plus they are easy frames for displaying the projects. I have more little projects finished or near finished, so I will be back when the light lets me get a good picture. Until then, keep on stitching!! Happy New Year to all stitchers everywhere! I hope this year will be the best stitchy year yet. This year I am getting the Embroidery Journal Project going. The main purpose is to give you a chance to make your stitching more personal. 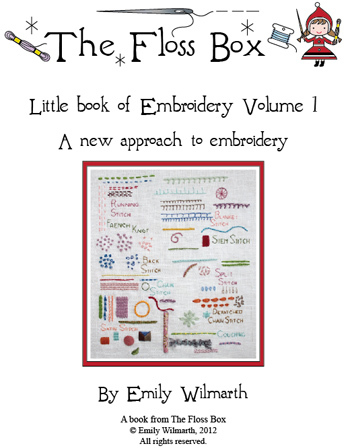 This post is the gathering place for anyone wishing to participate in the Embroidery Journal Project for January 2012. Everyone is welcome to join, and it doesn't matter if you complete your project in January or later. Just leave a note in the comments with a link to your project. I will collect links and post them on the main page for the Journal Project. If this is your first time reading about this project, you can read up about the embroidery journal project here. Thanks for participating! And those who are just checking things out, be sure to go to the links and see what people are doing! I'll post the link to my project here too when I have made it.